Encrypt your files and folders to protect your laptop from unauthorised access. With SensiGuard you can be sure that your information is secure even if your laptop gets lost or stolen. SensiGuard offers quick and easy password protection of your USD flash drives. No matter where you are, you can be sure that the files on your thumb drive are fully protected. Can’t remember all of your passwords? With SensiGuard password management functionality you won’t need to use weak, easy to remember passwords ever again. SensiGuard protects your confidential information even when you delete files. Use SensiGuard to securely shred files and folders so that they can’t be recovered even with the help of file recovery software. SensiGuard makes encryption easy and accessible. Lock your files and folders with just a couple of mouse clicks and enjoy 100% data protection. Important! Read this before updating to Windows 10! Otherwise your copy of SensiGuard will stop working. Is the personal information on your computer secure? Do you have confidential documents sitting in unprotected folders? What would happen if your most private files fell into the wrong hands? Relax. SensiGuard is the fastest and the easiest way to protect files and folders on your PC and your USB flash drives. STAY IN CONTROL with SensiGuard file encryption software - the hassle-free way to protect your confidential data, such as documents, photos and personal information. SensiGuard provides robust file and folder encryption, which means that you will never have to worry about your private information leaking out. Your credit card data, personal emails, tax returns, photos and other private files will remain under lock and key. Encryption is pretty heavy stuff and most encryption software is difficult to use, often requiring you to create special "folder lockers" or "virtual volumes" to hide your files. This forces you to reorganize your filing system and interferes with how you access your data. But SensiGuard is a different story. Despite employing the same powerful 256-bit AES encryption used by the big guys, the similarities stop there. SensiGuard is user-friendly and extremely easy to use. Try SensiGuard file encryption software for FREE! 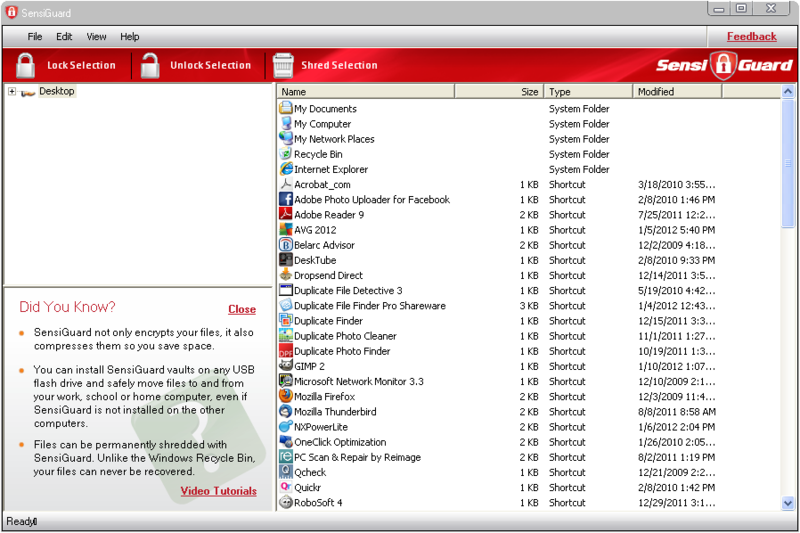 Looking for a quick and easy way to lock your sensitive files and folders?